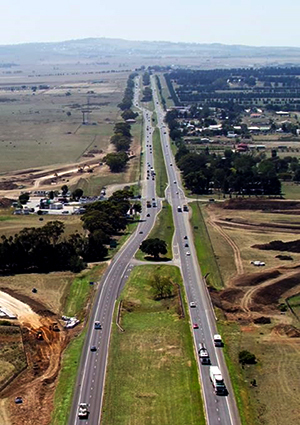 The Amaroo and Lockerbie Main Sewer projects involve building critical sewerage infrastructure to service proposed developments between Craigieburn and Wallan in Melbourne's Northern Growth Corridor. The project involves constructing approximately 18 kilometres of main sewerage pipelines. These pipes will collect and transfer sewage from the vast majority of the proposed developments in the northern growth corridor. The sewers are being constructed alongside the Melbourne to Sydney railway reserve, generally following the eastern side of the reserve. This location was chosen to minimise impacts to development and the environment. The pipe reserve will provide a beneficial visual and acoustic buffer from the Melbourne to Sydney rail line, and Yarra Valley Water is investigating whether the reserve may be used as a bike or walking trail. In June 2017, we finished work on the Amaroo Main Sewer Project, which involved building over eight kilometres of critical sewerage infrastructure, to support the growth of communities in Melbourne’s northern growth corridor. Our contractor, John Holland Pty Ltd, started constructing the new sewer in June 2015, and the works were completed in June 2017, six months ahead of schedule. The main sewer is a gravity sewer pipe running deep underground along the eastern side of the Melbourne-Sydney railway. The pipe’s internal diameter is up to 1.6 metres, and was constructed up to 20 metres deep with an average depth of 14 metres. Over seven kilometres of the sewer pipe was built by tunnelling, using Herrenknecht Tunnel Boring Machines (TBMs). The Amaroo Main Sewer is expected to come 'online' in mid-2018. Read more about the construction of the Amaroo Main Sewer Project . Construction of the Lockerbie Main Sewer is scheduled to commence in 2019. In November 2014, the Minister for Planning approved the planning scheme amendment. The planning process and mechanisms were determined in consultation with the three councils, the Department of Transport, Planning and Local Infrastructure, the Department of Environment and Primary Industries (DEPI) and the Metropolitan Planning Authority (MPA). Yarra Valley Water sought the required approvals under the relevant state and commonwealth government legislation including but not limited to the Road Management Act 2004, the Rail Corporations Act 2006, the Flora and Fauna Guarantee Act 1988 and the Environment Protection and Biodiversity Conservation Act 1999. For further information please contact Andrew Cosham, Major Projects, on 9872 1326.